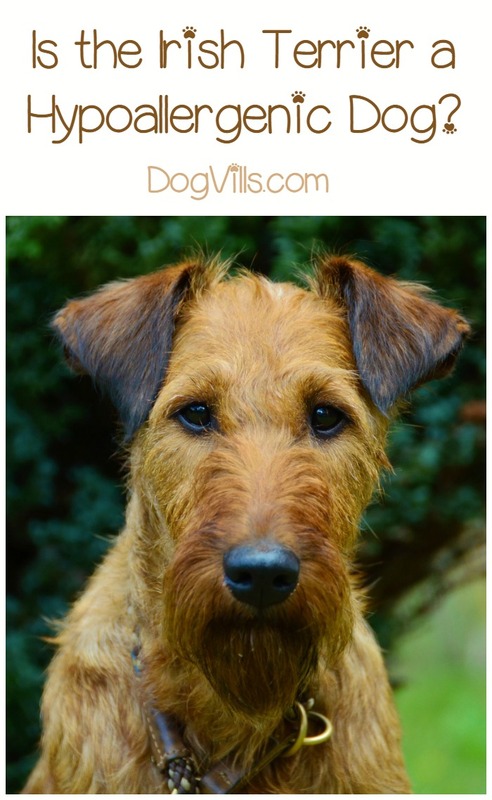 Hypoallergenic Dog Breeds: Irish Terrier Hypoallergenic? Is the Irish Terrier a Hypoallergenic Dog? Irish Terriers make great family dogs – for the right family. Irish Terriers don’t shed, making them perfect for people who suffer from allergies. They are also very smart, and while that can be a plus, it also serves to strengthen their stubborn streak. Irish Terriers are an excellent choice for a family looking for hypoallergenic dog breeds that also has previous experience with dogs. Let’s start off by talking about what makes the Irish Terrier hypoallergenic. If you’ve read any of my other articles on hypoallergenic dog breeds, you probably know everything that’s coming next by rote. However, if you haven’t this little bit is an important insight into what makes a hypoallergenic dog hypoallergenic. To begin with, there are no truly hypoallergenic dog breeds. All dogs have the allergens that make some people have reactions. These are saliva, skin cells, and urine. Most people think that they are allergic to dog hair, but they’re actually allergic to what is ON the dog hair. You see, a hypoallergenic dog is merely a dog that doesn’t shed. This lack of shedding keeps all those allergens planted firmly on the pooch. All you need to do is give them a good bath once a week, and your allergies will stay in check. Now that we’ve got that out of the way, we can get back to talking Irish Terriers. Irish Terriers are hypoallergenic, which makes them one of the default choices for anyone like me who loves dogs but who is also allergic to them. Physically, they’re the answer, but there’s more to it than that. Irish Terriers bond closely with their family, which is a good thing. They’re highly intelligent, which is also a good thing. Unfortunately, they are also generally known to be scrappers, muley, and very good at running the house. Those are all not so great. People who are considering the Irish Terrier need to be aware that this is not a dog that just does what you want. Their high intelligence coupled with their stubborn streak means they make you work for their obedience. This is a dog that wants to know what’s in it for him. Be aware of that going in so you aren’t overwhelmed and under prepared when training gets dicey. And it will. Because of their scrappy nature, it is absolutely VITAL to socialize them early and thoroughly. Irish Terriers will mix it up with any dog that gets aggressive with them. Don’t let my characterization of Irish Terriers as stubborn and scrappy deter you from getting on if you think a high energy breed who loves his family will fit your lifestyle. These dogs are by no means untrainable. I just think it’s so important for people to know what they’re in for. Irish Terriers are loving dogs, but they are also hard headed, and they like to be in charge. If you know that going in, and you have lots of patience, you’ll have a great hypoallergenic companion. As always, make adoption your first option. You’d be surprised at how many purebred dogs you’ll find in your local shelter. You might even find an Irish Terrier. If not, check rescue sites that specifically deal in Irish Terriers to find the perfect companion who also needs the perfect home. Do you have one of these hypoallergenic dog breeds? What do you love about the Irish Terrier?